Choose from 24 hotels and guest houses in Gwent and Glamorgan. Shown below a just a selection of the hotels available. To search within an area please use the menu on the right. Tides Reach Guest House - Situated in a prominent position overlooking the promenade, Mumbles Head and Swansea Bay, this charming B&B is an ideal base from which to explore Swansea and the surrounding areas. Built in 1855, Tides Reach is an elegantly furnished and appointed guest house, offering fresh fruit and a traditional cooked breakfast. Recently awarded 5 stars by the Tourist Board, Tides Reach has the highest standards in comfort and service. Guests can use free Wi-Fi in every room. The staff also aims to provide an informal, friendly place to relax and savour the views. During your stay you can explore the village of Mumbles, the Gower and the numerous Blue Flag beaches in the area, including Langland Bay, Caswell Bay, Bracelet Bay and Knab Rock, which are all only a short walk away. Blue Seas Bed and Breakfast - Blue Seas can be found in the 12th century village of Newton, situated in South Wales most popular holiday resort Porthcawl. Come and join us and enjoy our family run bed and breakfast, situated on the waters edge overlooking the idylic Newton Beach adjacent to Trecco Bay. Cast your eyes a little further to explore the Glamorgan Heritage Coast and surrounding country side. A perfect location for all your holiday activities. The Avala Guesthouse - Ideally located within walking distance of Cardiff's vibrant city centre, this charming Victorian property has been refurbished as a comfortable, modern guest house. The Avala has recently been awarded a 3-Star Guest Accommodation grade by Visit Wales. All of the rooms are en suite and have LCD TV with around 30 Freeview channels. Complimentary tea and coffee making facilities are also available. In the evenings you can unwind and plan your next day's activities in the comfortable guest lounge, complete with TV and complimentary Wi-Fi. Smoking is not permitted anywhere inside the building. The Brentwood Hotel - The ideal base from which to explore South Wales's beautiful coastline, this family-owned and run hotel is situated on Mary Street, bordering the beach and promenade in Porthcawl. Just a few miles away from the M4 motorway, the Brentwood Hotel is easily accessible, with Cardiff just 25 miles away and Swansea within 19 miles. All the main towns and cities and the coastal areas of South Wales are also within easy reach. In addition to the beach and promenade, within walking distance of the hotel you will find Porthcawl's shopping centre, bus station and nightclubs. Nearby you can also find 3 golf courses, a swimming pool and a health and fitness centre. Church Guesthouse - Under new management since August 2009, this refurbished Victorian building is in the quiet, leafy suburb of Pontcanna, 1 mile (1.6 km) from the Millennium Stadium and Cardiff Central Rail Station. The Church Guesthouse is an easy walk from Cardiff's city centre and its major attractions. Sophia Gardens are just minutes away; Cardiff International Arena (CIA) and Cardiff Castle are around 1 mile away. Pontcanna is a peaceful Cardiff area, with some very good shops, bars, restaurants and clubs. All of the rooms have an en suite shower room and some have baths. All rooms have TV's, Wi-Fi internet access and tea/coffee. Sky TV is available for guests. There is a family room and the guest house will provide cots, highchairs and a room fridge. A generous Welsh breakfast is also available for guests to enjoy. All guests are given their own key and are free to come and go as they please, accessing the building at any time. Free, unrestricted parking is available in the streets surrounding the guest house. Holm House - This exquisitely designed 1920s house is cosy, decadent and indulgent and has stunning views across the Bristol Channel to the islands of Flatholm, Steepholm and beyond. South of Cardiff, the beautiful Holm House is located on Penarth's Marine Parade and features the best of modern and classic Welsh, British and European design. It can be described as quirky, bohemian and sumptuous. Bedrooms are equipped with luxuries including Bang and Olufsen media and free Wi-Fi. The holistic spa has a relaxation room with sea views, a small gym and a large hydrotherapy pool with swim jet. The Coast House - On the seafront in Mumbles, with spectacular sea views of Swansea Bay, this small, charming, family-run guest house prides itself on its comfortable accommodation and tasty breakfasts. The Coast House has just 7 rooms, guaranteeing its guests friendly, attentive, individual service and a quiet, relaxing break. All of the rooms are en suite and most of the rooms have good sea views. Each room has a hairdryer, fluffy towels, complimentary tea/coffee making facilities and a TV with Freeview digital channels. The price includes a full cooked breakfast, with a choice of fruit juices, cereals, fresh fruit and yoghurt. As it is only a small guest house, the Coast House cannot provide 24-hour check-ins. Guests should provide their arrival time in advance, in order to ensure that they can be checked-in. The Coast House is a family-run guest house with over 30 years experience of looking after guests. Tanes Hotel - Within walking distance of Cardiff's lively city centre, the small, family-run Tanes Hotel provides a warm welcome and superior service for a comfortable stay. Following a long day of Cardiff sightseeing, you can return to Tanes Hotel and relax in the communal lounge where you can read, chat to other guests or plan your next day's activities. Tanes Hotel is a 3-star self-assessed Guest Accommodation. Crescent Guest House - On a hill, in a quiet residential crescent, with superb panoramic views of Swansea Bay, this Edwardian town house is now a 4-star guest house offering charming en suite rooms and free internet access. 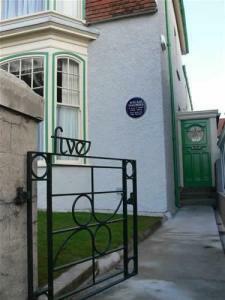 The Crescent Guest House has 6 rooms, all tastefully furnished to a high standard with modern en suite facilities. The rooms have wired broadband internet access and flat-screen TVs with more than 30 Freeview digital channels. Some rooms have impressive views over the city and the sea. The guest lounge has a real fireplace, comfortable sofas and a bay window with a magnificent view. Guests can also enjoy the first-floor glass-roofed atrium area, surrounded by original stained glass windows. There is a public computer for guests to use outside the lounge. A full, traditional cooked English breakfast is included in the price. There is good on-street parking, along with a private car park. Dylan Thomas House - The birthplace of the poet, Dylan Thomas, this Edwardian house has been beautifully restored to its original condition, and offers a unique overnight experience. You can walk back into Edwardian times and enjoy the peace of a house with no TV, but instead with a phonogram, books, newspapers of the day and card games to keep you amused. Guided tours and walks are available. Close to Cwmdonkin Park, Dylan Thomas House is just 1 mile (1.6 km) from Swansea city centre and 5 miles (8 km) from Mumbles and Gower beaches. The house sleeps up to 6 people in 1 double, 1 twin and 2 single rooms including Dylans tiny bedroom with its original gas lamp point. Over two-thirds of Thomas' published output was written here.